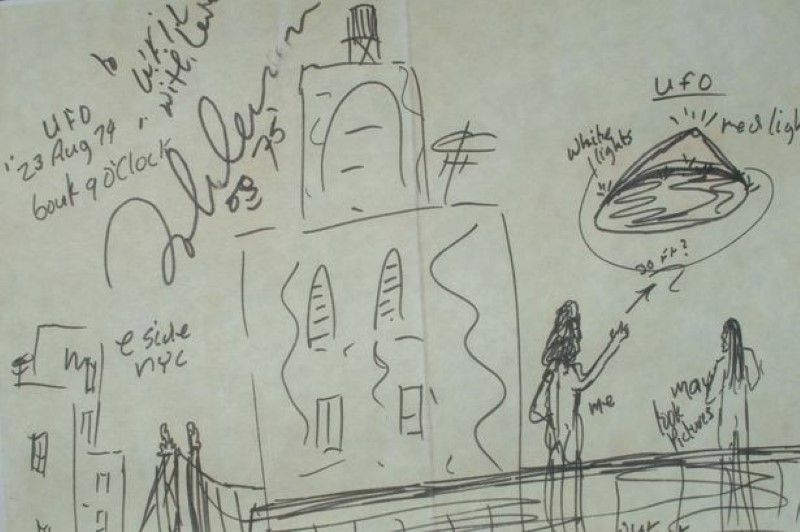 Mr Kellett said a few months ago he bought Lennon’s sketch of an encounter he had with a flying saucer in New York – the same year as the North Wales incident. Lennon, whose first wife Cynthia died earlier this year and once lived in Ruthin, was said to have made a number of drawings following the sighting. He claimed he was standing on the balcony of his apartment on August 23 1974, with former girlfriend May Pang. Mr Kellett, an avid collector of UFO material and a Beatles fan, said when he was the chance to acquire the sketch, he jumped at the opportunity. He said: “A friend of mine told me it was becoming available from a private collector and I thought, this was a double dream for me. “I am a massive collector of all things UFO and have a huge archive and am a collector of Beatles memorabilia. “I have a leather jacket worn by John Lennon in 1969 up until 1974. So this was fantastic. “It is one of a few he made he made of the incident. However, Mr Kellett remained tight-lipped over how much he paid for the sketch and said it is stored away in a bank vault. Families in the villages of Llandderfel and Llandrillo were settling down to watch television when they heard an explosion and the ground shook. The eruption measured 3.5 on the Richter scale.